Trombonist Michael Dease was born in Augusta, Georgia. His propensity for the arts landed him at John S. Davidson Fine Arts Magnet High School, where he studied saxophone, voice and trumpet. During his senior year, after sage advice from another Augusta, Georgia jazz mainstay, Wycliffe Gordon, Dease pointed his ambition towards the trombone, what would ultimately become his primary instrument. Dease furthered his studies at Juilliard School where he earned his bachelor and master degrees. His continued journey includes several awards, including a Grammy. He also serves as an associate professor of jazz trombone at the MSU College of Music. 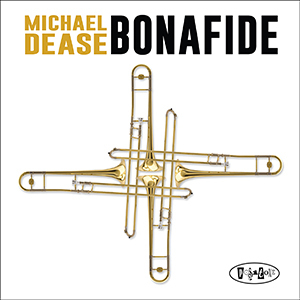 His latest recording Bonafide is his sixth outing for Posi-Tone Records and features a venerable line up of trombone stalwarts, including: Marshall Gilkes, Conrad Herwig, Gina Benalcazar, Sam Dillon, with the deeply swinging rhythm section of David Hazeltine, Todd Coolman and E. J. Strickland. The album is a collection of exuberant performances of equally skilled trombonists covering a wonderfully fluid collection of tunes. A highlight includes “Theme for Basie,” a fitting title for this melody. The Basie band was known for its balanced voicing and ensemble passages. The band also articulated the notes within the phrase as a unit, giving a clean and consistent color to each section. In this case, the trombone choir and one woodwind achieve the same concept. Dease leads the way as he splits the choir into melody and harmony parts in a call and response pattern with Coolman filling the spaces. The melody is beautiful, and the band hits it, everyone playing in that clean Basie style. Dease always has inner moving voicings that keep his orchestration a joy to listen to. His solo is simply amazing, he covers the full range of the horn with a focused and controlled sound. Dease’s lines are always melodic and build motivic ideas in a manner that swings hard. Hazeltine plays a beautiful solo with the bones colorizing with backgrounds. The trombone soli is Basie-esque in its presentation, but the lines are more like what Basie’s saxophone section would present. Another testament to the technical abilities of this group. No jazz album is complete without a blues. In this case Dease gives us an outstanding arrangement of “Tenor Madness.” Of course, Dease plays with the feel and augments the melody and the result is a fresh approach to this well-known jam session favorite. The waltz time section is devoured by the rhythm section as Dease spins his magic. Clean attack, beautiful blue notes and crazy hip fast passages, and the arch up to emotional held notes. Coolman and Strickland make the feel of the changes seamless, but no matter the time signature, these two swing! Strickland is given space to show his chops at the end against a rhythmic ostinato. This is what moves the jazz heritage forward, creative reworkings of tunes we all know and love. Dease continues to create signature pieces to his catalog. This, like his past recordings, is a delight to savor. Each release does seem to deepen its breadth, as Dease clearly continues to break his own barriers and push towards that sweeter spot with each offering.